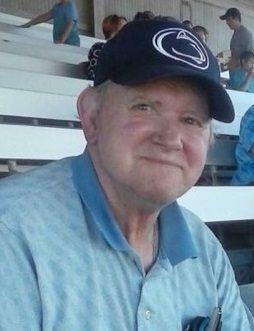 Ronald M. “Ron” Lusk, 80, of Cogan Station, passed away Thursday, April 26, 2018, at ManorCare South Williamsport. Born Dec. 24, 1937, in Williamsport, he was the son of the late Harold and Marie (Howard) Lusk. Ron was a 1956 graduate of Williamsport High School and attended Williamsport Technical Institute. He served in the U.S. Army National Guard. Ron had been employed by Bethlehem Steel and later retired from White Deer Run after 20 years. Ron was a member of the former Memorial Baptist Church now Hillview Baptist Church. He enjoyed hunting, fishing, Penn State football and playing guitar. Surviving are a son, R. Mark Lusk (Denise Dieter), of Jersey Shore; four daughters, Joyce Lusk-Pequignot, of Cogan Station, Kimberly Gibble (John), of Duncannon, Cheryl Follmer (Bob Lundy), of Williamsport, and Karen ONeal, of New Braunfels, Texas; eleven grandchildren; seven great-grandchildren; a brother, Louis “Bink” Lusk (Rebecca), of Tennessee; two sisters, Joyce Crossley and Diana Casale (Salvatore), both of Williamsport; and a sister-in-law, Annis Lusk-Straub, of South Williamsport. In addition to his parents he was preceded in death by a brother, Harold “Sonny” Lusk and a sister, Shirley Flexer. A funeral service to honor the life of Ron will be held 11 a.m. Wednesday, May 2 at Hillview Baptist Church, 40 Hillview Ave., Williamsport, with the Rev. Timothy R. Kinney, Sr. officiating. Burial will follow in Trout Run Cemetery with military honors. Family will receive friends from 10 a.m. until time of service at Hillview Baptist. In lieu of flowers, memorial contributions may be made in Ron’s name to Hillview Baptist Church, 40 Hillview Ave., Williamsport, PA 17701 or Susquehanna Health Foundation C/O Susquehanna Home Care and Hospice, 1001 Grampian Blvd., Williamsport, PA 17701. Arrangements entrusted to Knight Confer Funeral Home.